The idea being to look through it for any interesting patterns in the data. Mostly I noticed that while a very few airports were “near the middle” of all the surrounding stations (often in Europe where there were not a lot of ‘nearby’ stations in the listings) there were many cases where the airport was nearer the high end than the low or middle. (Often in the USA which seems to have more stations than anywhere else). There was a little bit of Cherry Picking, in that I tossed (i.e. didn’t bother with the cut / paste ) on those stations that were not interesting. (Usually those without much ‘nearby’). This is also ‘unscientific’ in that I’ve not done the niceties of a truly random sample (depending on my brain to just ‘pick a city’ of interest) and not statistically valid (maybe 20-something locations total). Also I have no idea how Wunderground chooses to pick ‘nearby’ stations nor what ordering process ‘ranks’ them down the page. Oh, and while I mostly picked the large “international” airport, sometimes I didn’t. So for Sacramento, they have 2 or 3 airports that are “in town” (including military bases) and the new Sacramento International Airport is some dozen odd miles north of town out in the middle of farms and fields. Any “nearby” station will be far far away… so I picked one of the stations “near town”. That way the “nearby” stations have some hope of actually being nearby. So in this posting I just started looking at the very last station I picked. Salt Lake City International Airport. I then took the listing of ALL stations given below it (after allowing a minute or two to stabilize on the loading of the page). Looking through that list, I tossed the highest and the lowest. and prompted me to pitch the highest and lowest as likely spurious (and not contributing much anyway. For each city, the remaining data are stuck in an Open Office spread sheet, the average of all values calculated, and a plot made. Yes, I’ve done all this in degrees F. Sometimes I remember to swap the settings on Wunderground over to C, but often I don’t. As I’m in the USA it comes up in F by default (and since what scale is used is, really, completely irrelevant, I typically just don’t care…) And at 2 AM and later I’m not at my “most likely to care about what folks in Europe do or like” state anyway ;-) If it bothers you, you are welcome to repeat the process in whatever scale you like. The average of all 26 data items is 68.81 and that makes the Airport 4.19 F to the hot side of the average ( or 2.313C if I’ve converted correctly). Now IF the airport were representative of the sample area, one would expect it to be closer to the mean. Hmmm…. If, on the other hand, airports tend to be located in broad lower valley areas where it is warmer than the surroundings, have large vertical mixing from the air traffic (that is warming on cold still nights) and has acres (hectares) of tarmac and concrete that are not as cooling as plants with transpiration; one would expect them to be a bit warmer than representative. But for now, what we have is this one station and this one graph… and it is interesting. First off, it is pretty clear that the Airport is close to the top of the graph. Yes, there are other stations near the same value, but it’s not in the middle nor near the bottom. It’s near where a line connecting the “tops” would run. This is not a cool station; nor even a median one. Second, there looks to be more dispersion of values to the right than to the left. WUWT? One can only wonder. More of the graphs will need to be done to see if this is a “one off” or a common artifact. Are the stations laid out in physical distance order from the selected station? Is it a random artifact? Don’t know. All ‘future investigations’ and “Dig Here!” fodder. Finally, just the magnitude of the difference from the mean is surprising. 4 F warmer? 2 C is 4 x the IPCC “warming” so it would only take 25% of stations in this condition to account for all of the “warming” in the GHCN (and we know that airports are more than 1/2 of the GHCN stations). 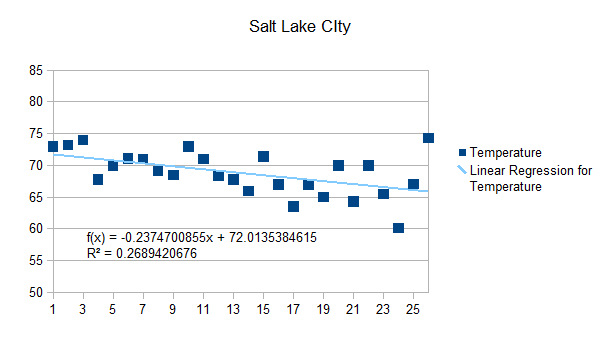 Yes, it will take looking at the rest of the sample and a formal analysis to figure out what impact this actually has; but on the face of it, it is clear that the Salt Lake City International Airport is unrepresentative of the actual average temperature measured in that area. (And as it cools into the evening, stations reporting ‘late’ ought to be high in comparison to the airport). I’m sure there’s more that can come from this one little graph, but those are the big bits that stand out to me. Here is a copy of what I grabbed to make this graph. It’s just a straight cut / paste, so will be hard to read. Maybe someone can find an interesting pattern in it. If nothing else, it documents where the graph came from. trigger a few showers and thunderstorms. Same general look to the data. I changed the range of the graph to start with the first station on the axis and end at the last station, stretched it out a bit so the number of each station can be seen (for easier comparison to the data listing below – but remember the two ‘left out’ station when counting…) but we get the same ‘dropping to the right’ effect. Reno at 68 F compares with the average of all (other than the two outliers) data at 62.75 F is 5.25 F or 2.92 C hotter than the average. This entry was posted in AGW Science and Background and tagged Airport Heat Island, airports, Global Warming, Salt Lake City. Bookmark the permalink. I think you may have found the problem, Airports! If we get rid of airports out global worming may just go away. I recently read that Greenland is melting. I don’t know the specifics, but I’m guessing they have airports. I read a science journal the other day that had the resent release of a 2000 year study on global temperatures. The conclusion was that there was a detectable down trend in long term temperatures. A couple articles below was another global warming post. They just ignore everything contrary to what they want. Global warming is an agenda, no science. With W underground amateur weather stations everywhere reporting there may be a way to check up on nearby airport thermometer reports to demonstrate this over temperature reporting trend without fighting the argument over thermometer graft change bias and creeping UHI. Just prove that an airport is a bad place to measure local weather conditions “for the record”. Just put up some more stations. A few more left in my random data grab yet to go. But enough so far to certainly justify doing an AHI “bubble” analysis on selected stations from the GHCN. What I will most likely do is pick a collection of a dozen or two representative stations from the GHCN that have decent ‘nearby’ coverage in Wunderground and do graphs, like these, for those stations. A quick sample of foreign airports showed not so much data available for some (like Russia…) so I may need to be selective about overseas coverage. Still, UK, Australia, and perhaps some parts of Latin America and Europe ought to be good. Japan is gadget crazy too so perhaps some decent coverage there. #1 – I was amused you picked Salt Lake City Airport as your first one. Not having anything to do with climate or weather, only that I have flown in and out of there. And it is not for the faint of heart! The mountains make the take off very interesting (almost vertical). #2 – Not all Airports suffer this, and if you get a chance, check out RIC. After many years, the airport is still rural. A local TV station has set up weather stations at many area schools. Having done some cursory observations of the temperatures from those stations and the airport, I have noticed that most in my area always read a few degrees warmer than the “official” reading at RIC. I know from experience that the TV station’s weather stations at the schools are not set in a scientific position (in other words, they are around a lot of concrete), but the normal UHI does not seem to be a problem here at least. That is merely a factor of blind luck when the airport was located way back in the day (much of the area around it is swampy, so there will never be a lot of development). Report Station You are about to report this weather station for bad data. Please select the information which is incorrect and click ‘Submit’ otherwise click ‘Cancel’. Salt Lake airport is an interesting condition. First of all, it is just about on the shore of the Great Salt Lake just South of what amounts to a swamp. To the East of the airport is Salt Lake City and East of that is the Wasatch Front which is a rather high range of the Rocky Mountains. You get some interesting weather conditions and the temperature can vary dramatically depending on which way the wind is blowing. At 3am, if it is coming in off the lake (the airport is near the lake) it can be quite warm. If the breeze is from the due east, it can be cooler. @ E.M – Even more interesting is that those “Varina” readings are right next door (almost). Varina is right next to Sandston, which is where the airport is located. So while they are both rural in nature, apparently the airport has enough asphalt to bump it a few degrees. Based on the Weather Underground API, I would say your hypothesis that the ones further down in the list are farther away. You can use the API to get the actual distance in miles or kilometers using the geolookup for an airport, as shown in the results for Salt Lake City below. This script might make it easier for you to download the Weather Underground data.